Memorial Day is a time when many of us display our U.S. flags. We do this to show pride and dedication to our great nation. I love to see our flag on display but not if it is raggedy. Many people are not familiar with proper ways of displaying and disposing worn out United States Flags. I hope this blog clarifies displaying and disposing of Old Glory. If an organization provides a flag retirement service, the flag can be dropped off and they will take care of the ceremony. Be aware of the fact that before accepting a flag for retirement, the organization should obtain information about its history. For example: Where has it flown? How long? 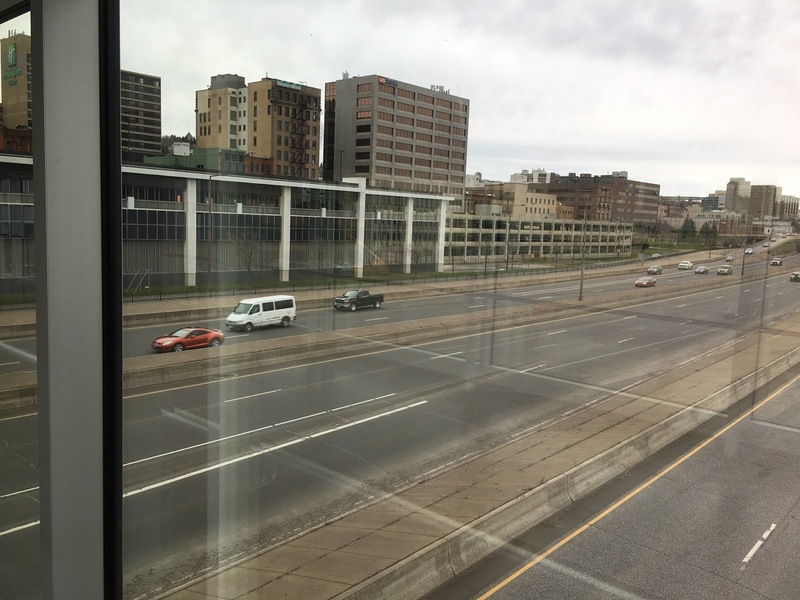 Any memorable events happen at that site? This information is used in the ceremony so please include it with the flag. I would suggest folding the flag neatly and including the information along with the flag in large ziplock bag. 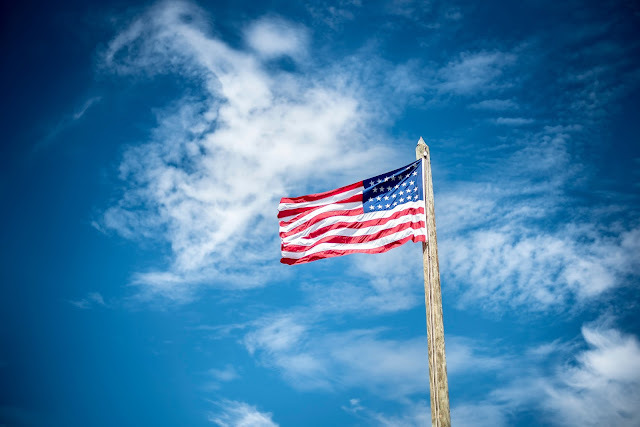 Each flag retirement ceremony may vary slightly, but the common and crucial element to any flag retirement ceremony is that the flag is retired in a dignified manner. 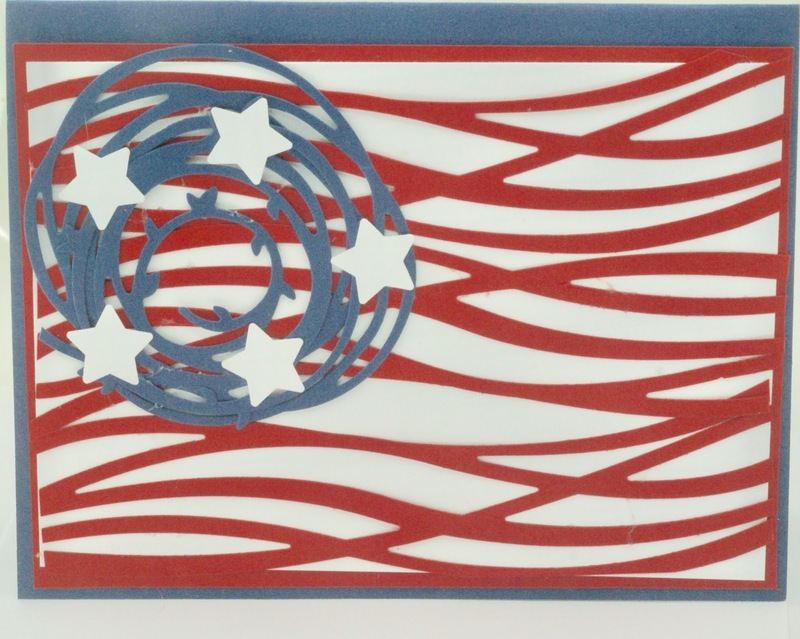 When thinking of Memorial Day and the U.S. flag, I was inspired to create a couple of items for my Delaware by Hand Memorial Day weekend Arts and Crafts fair. One item that I make is this abstract American flag card. I made a large numbers of these cards because I will also donate some to patriotic organizations in Delaware next year for their fundraising events. 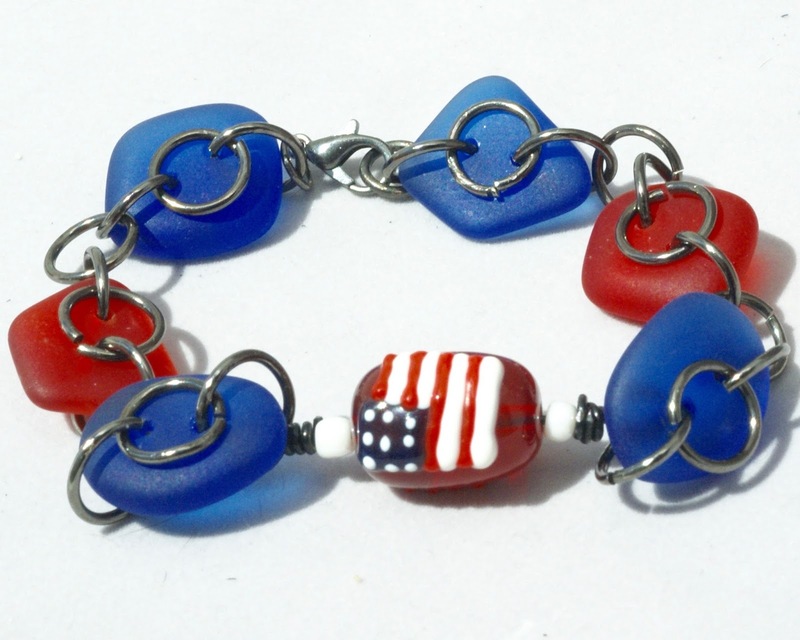 I also created several patriotic bracelets. I kept one of these for myself to wear especially for Memorial Day and the Fourth of July. I also followed my own advice and mended the hem of my U.S. flag before handing it outside. 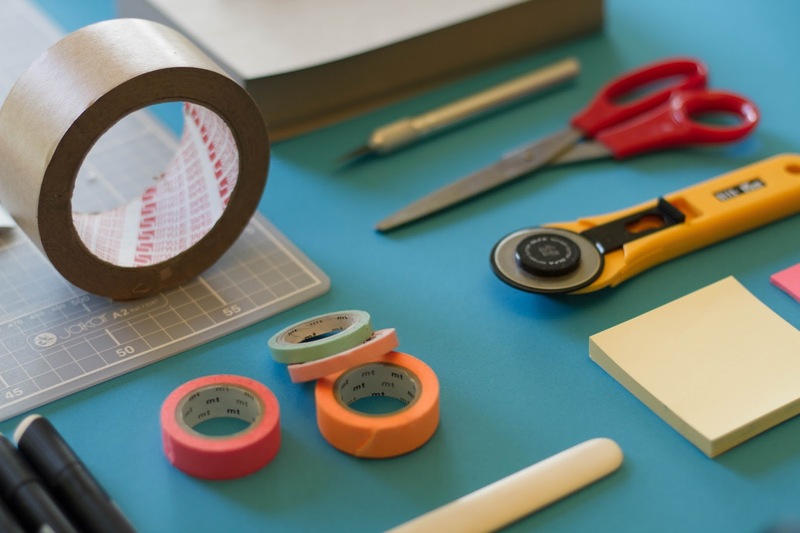 Recycling and repurposing help the earth. This month's We're All Ears challenge comes at a perfect time for me. I hate to throw away so many things, but I have to downsize or my house will explode. My favorite part of the challenge is to disguise something or alter it to save it from being discarded. Before I began I checked out this collection of recycled jewelry from www.RecycleArt.org. Who knew trash could be so beautiful? One trick to creating from junk or trash is to transform something unrecognizable from its former state. 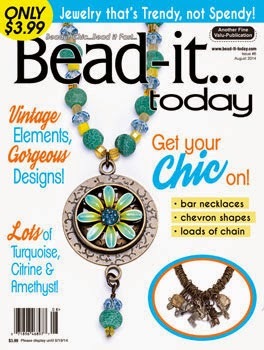 Another tip is to mix materials....found objects with new beads, art beads with upcycled treasures. 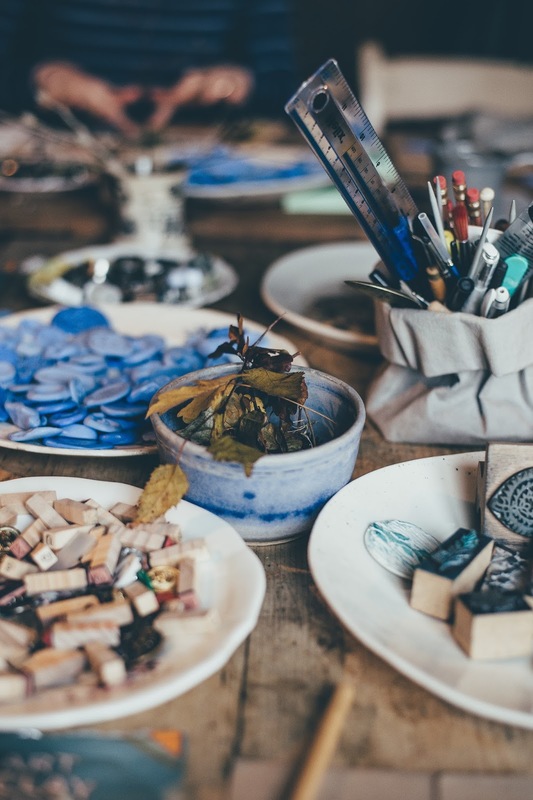 The challenge is to take something that no one would expect in jewelry and elevating it to the level of adornment thus saving it from the landfill. I took a long look through my large button collection. This made me organize my buttons a little more by size as well as color. I threw out some broken ones along the way, I then searched for matching pairs. I was pretty surprised that I did't have too many matching pairs. I then went through my bead collection to find beads that went with the 2 pairs of buttons that I choose to turn into earrings. I found two matching olive green buttons in my stash that I turned them into a pair of long dangle earrings. These OOAK earrings combine the colors of olive green, chartreuse, and yellow. I used olive green buttons and beads with silver jump rings, and chartreuse leaves. These upcycled earrings hanging about 2" long from silver plated lever back ear wires. The other pair of matching buttons I found are gray. OOAK silver dangle earrings are created with gray buttons, silver jump rings and beads, and red flower beads. These upcycled earrings hanging about 2" long. I love silver, black and red together. Button jewelry is always unique and I think these green dangles hit the mark. Please take a look at some of my other earrings at http://www.etsy.com/shop/BayMoonDesign?section_id=5555460. I pride myself in making reasonably priced and unique earrings. I have lot more buttons and junk! 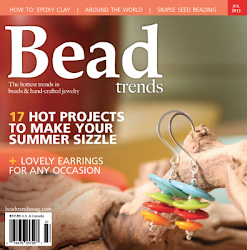 I have some tin cans I have been saving to make beads for jewelry. I hope to find time to get this project done soon and blog about it. 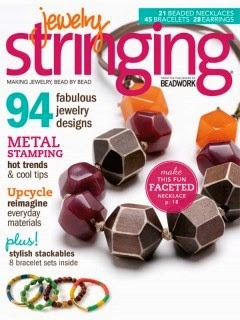 Right now I am busy trying to get ready for a local craft fair--The Delaware by Hand Spring Outdoor show. If you are in the Lewes, Delaware area on Saturday, May 27, 2017, please stop by. More to come on that topic next week. This month's May Art Bead Scene Challenge is based on the painting "Bowl of Fruit, Violin, and Bottle" by Pablo Picasso. The painting is an example of the Cubist technique that was developed by Picasso and Braque in Paris before the First World War. Cubism moved away from the traditional realistic depiction of an object from a single viewpoint. Objects were fragmented and seen from different angles, blurring the distinction between two- and three-dimensional representation. The two artists were influenced to some extent by Cézanne's method of breaking down all forms into basic geometric shapes. 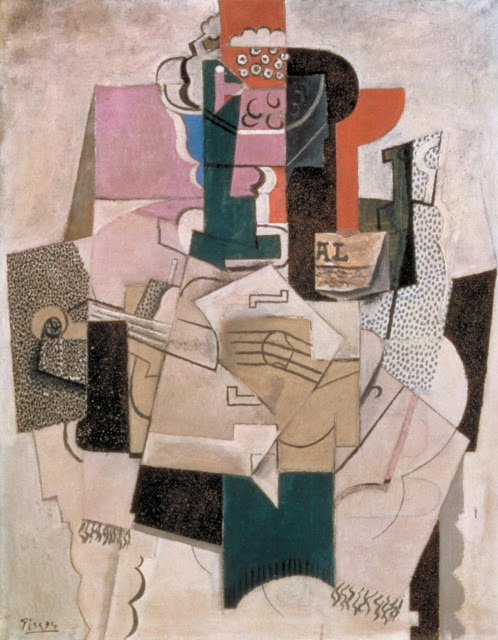 In this painting the fragmented forms of a table, a bowl of fruit, a bottle, a newspaper and a violin are present. Picasso put together areas of color and texture to evoke objects that can be recognized. The shapes and colors are balanced to maintain the appearance of flatness. When designing this bracelet, I kept in mind the colors and 3 dimensional shapes used in the painting. 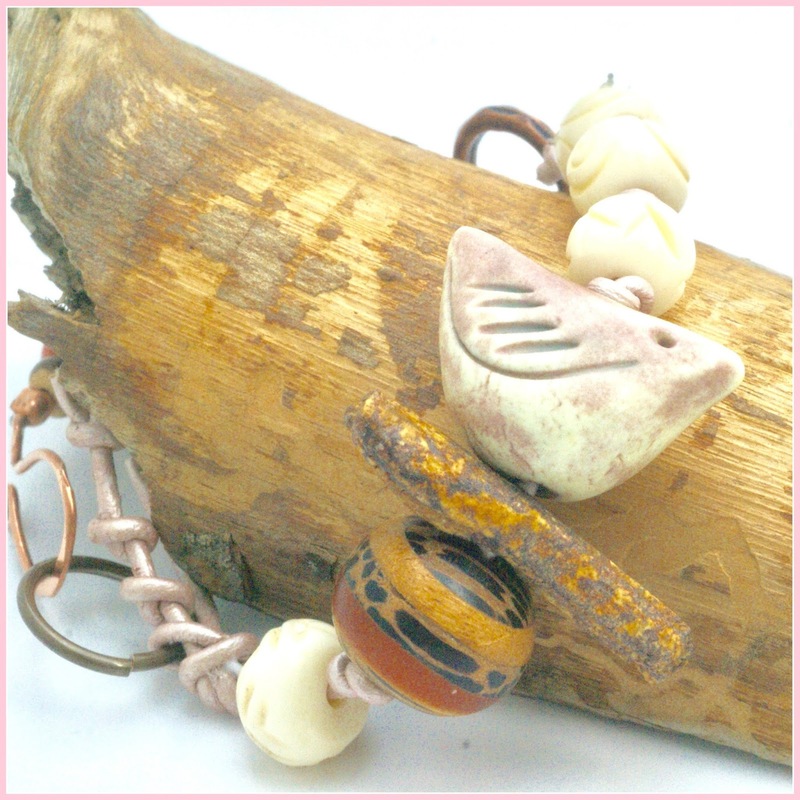 The pale pink in the painting is mirrored in the ceramic bird by BlueberriBeads and the brown in the ceramic twig by artist Diane Hawkey. I pulled in more of the pale pink by using pink leather from Classic Elements. This bracelet is very 3 dimensional and geometric. I used some interesting beads--vintage beads as well as a handmade copper ring which is a reproductions of vintage beads from a private collection. 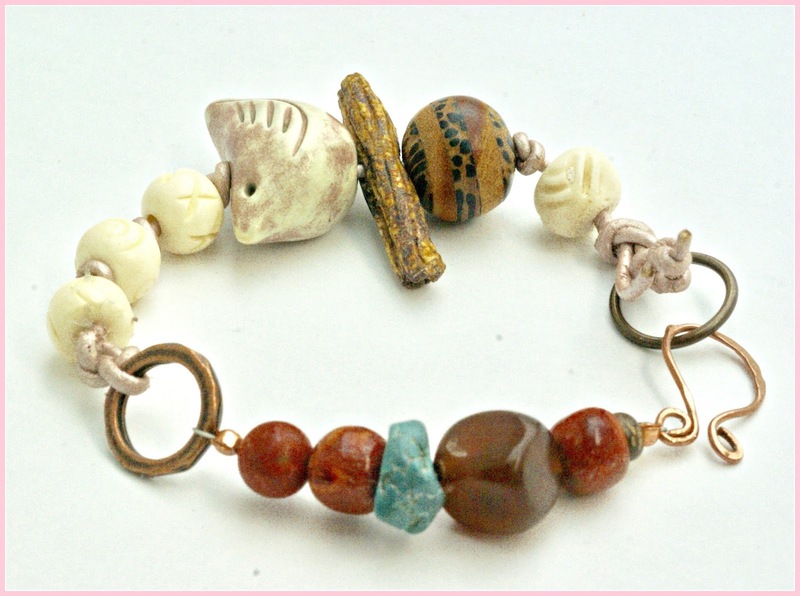 The handmade copper clasp made by BayMoonDesign. A pale pink leather is knotted in parts of the bracelet to add more pink. What are your thoughts about this bracelet? 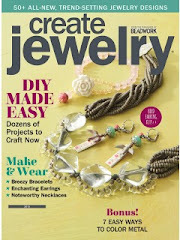 I haven't made any jewelry for several weeks because I traveled to Minnesota with my husband and son. My son moved there to start a new chapter of his life and we helped with the relocation. I knew very little about Duluth except that it is cold there in the winter. I discovered it is cold in the "spring" there too--just not as cold. When we arrived at the end of April, there were still traces of snow on the ground. That got my attention! I also new that Bob Dylan was born in Duluth and when he was about 16 or 17 years old, he went to hear his idle Buddy Holly play at the Duluth National Guard Armory which is still there today. 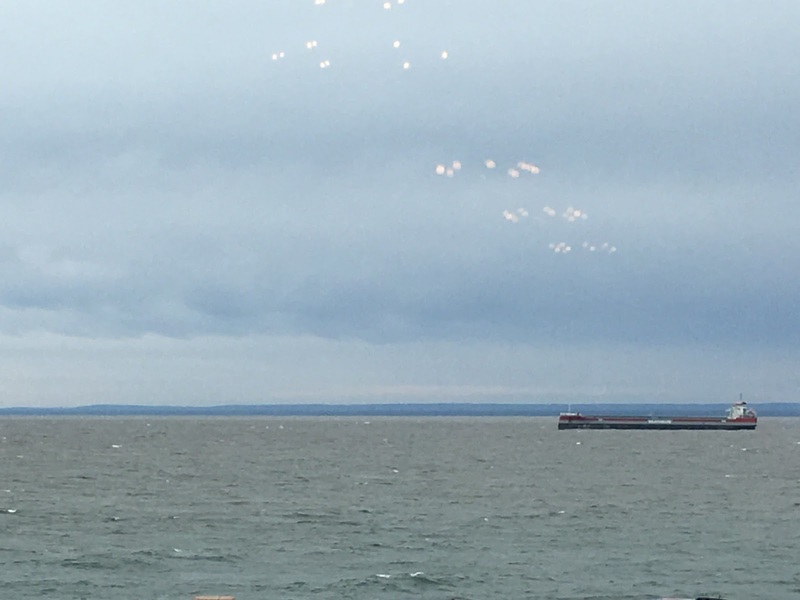 Before going there I did some reading to discover more about Duluth and found that it is a major port city in Minnesota and has a population of 86,110. Situated on the north shore of Lake Superior at the westernmost point of the Great Lakes, Duluth is accessible to oceangoing vessels from the Atlantic Ocean 2,300 miles away via the Great Lakes Waterway and the Saint Lawrence Seaway. Around the start of the 20th century, the city's port passed New York City and Chicago in gross tonnage handled, making it the leading port in the United States. One huge surprise for me were the steep hillsides that climb from Lake Superior to high inland elevations. Duluth has been called "the San Francisco of the Midwest. Before World War II, parts of Duluth had a network of streetcars and an "Incline Railroad" like San Francisco's cable cars. I had been told that Duluth has great food and beer. There are over half dozen breweries in Duluth. I am not a huge beer drinker but I did sample a few and they were tasty. There are a variety of restaurants here. We ate at a few of the most popular in our short stay. Located in a historic and renovated building the Fitger's Brewery dates back to 1885. It is listed on the National Register of Historic Places. 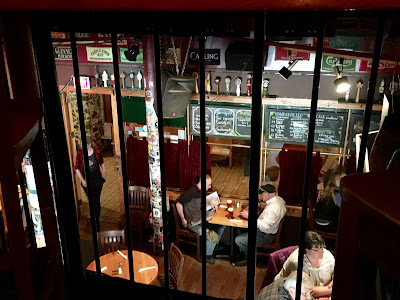 I loved the historic atmosphere, food, and beer here. 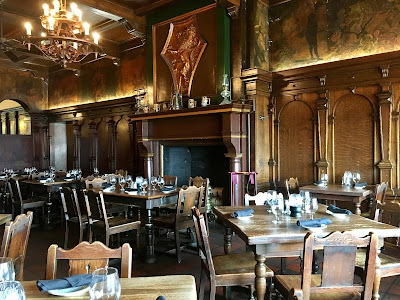 Pickwick Restaurant and Pub is another historic restaurant located right next door. An area landmark since 1914, it offers award-worthy meals with an Old World atmosphere. The European style woodwork and furniture is a hardy hat tip to Duluth’s skilled immigrants. We had to visit a ribs joint and we picked out the newly opened OMC Smokehouse. OMC stands for Oink Moo Cluck. Too cute! The menu featured items like pulled pork, grass-fed beef brisket, St. Louis style ribs and Nashville hot chicken (fried and spicy). They also carried beer from a local distillery. 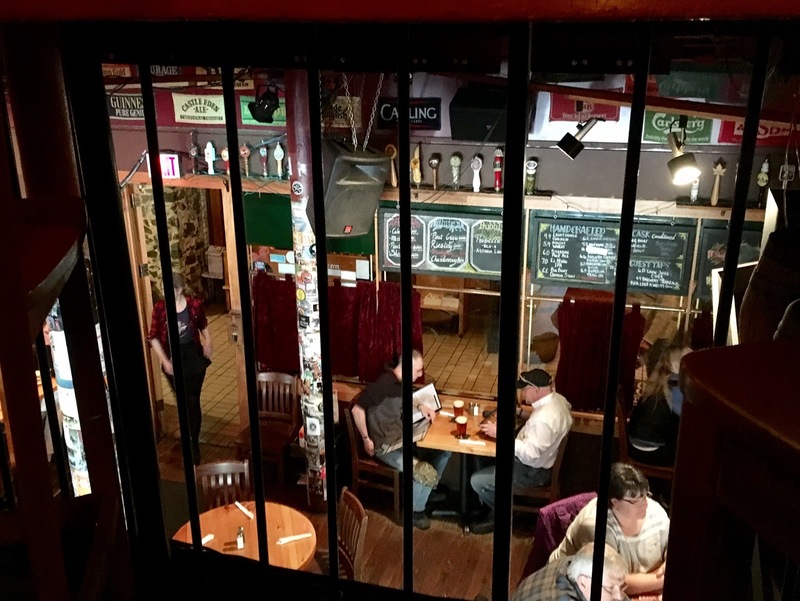 Whether it's the homemade comfort food like pies, pasties or pot roast (made with bison, of course) or the commitment to doing strange things like raising bees on the roof, Duluth Grill makes you take notice. Black Woods Grill and Bar is another great spot to get a great meal. I was very impressed to read that Brad Pitt and Rory Gilmore were a few notables who are there. 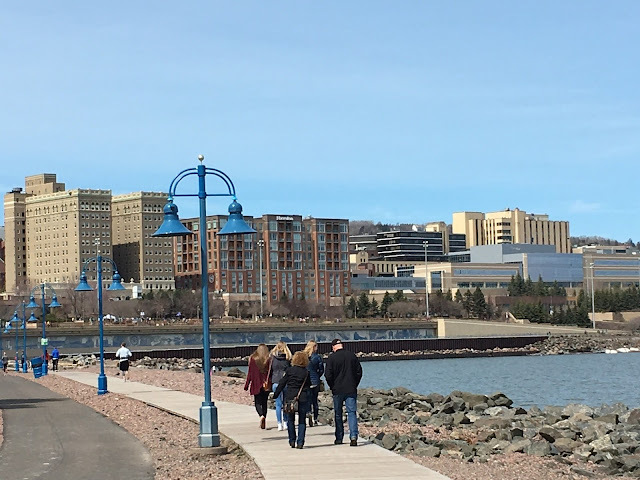 Downtown Duluth's waterfront has a 3.5 mile sky walk that allows walkers to travel in climate controller comfort to movies, shops, restaurants, etc. We were glad to escape the 40 degree and heavy. I love seeing the old buildings and homes from the turn of the century. A visit to Canal Park along Lake Superior is a must. On the way you can enjoy the natural beauty of the lake. You can also view an image wall with mosaics based on photographs from Duluth's waterfront history. 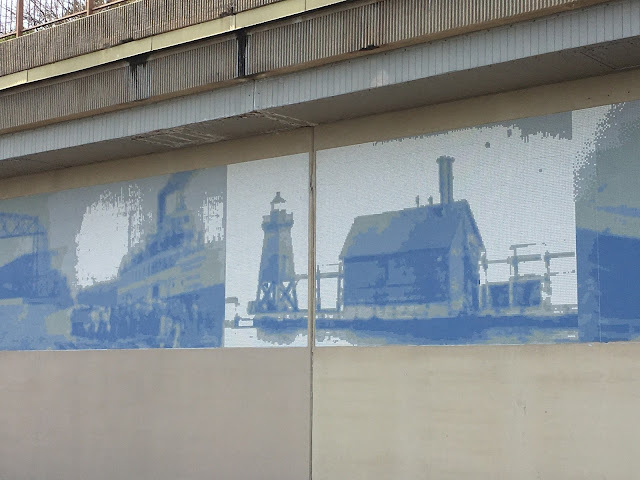 In the heart of Canal Park, set against the majestic Aerial Lift Bridge, is a Great Lakes vessel from 1930's. 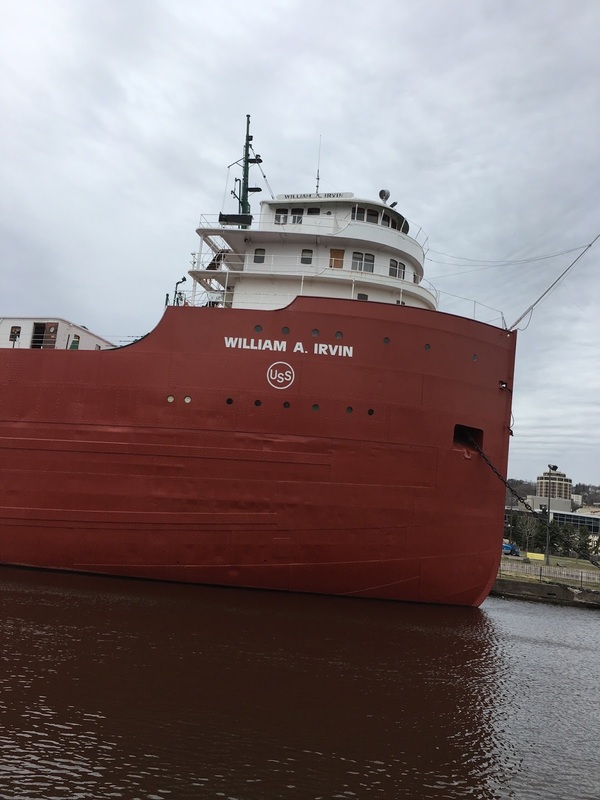 Despite carrying iron ore and coal for 40 years through treacherous storms, the William A. Irvin remains in pristine condition today and you can tour through it. Every time i visit a new place, I always try to find a bead shop and stop in to buy some beads. I love to create my own souvenirs. I found a gem in Duluth in the Canal Park area. 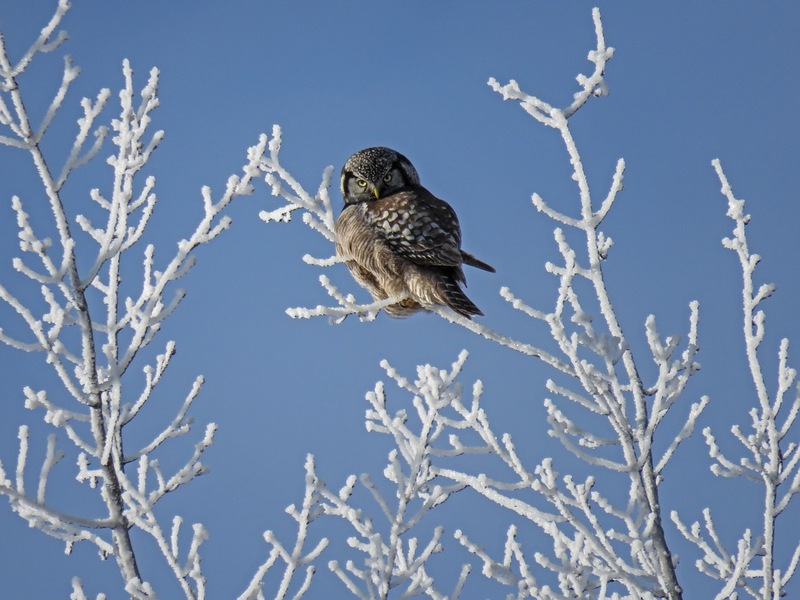 The Spirit Bay Trading Company supports local (and USA made) businesses and artisans. The carry products inspired by the northwoods and nature. Even though I was only in Duluth for a long weekend, I got a real feel for the town and hope I get to return there. It definitely has a strong arts scene that I would like to explore.